The smoking season is nearing an end, well, who am I kidding, the season never ends. Every Friday I ask the guys if they are cooking anything interesting over their weekend, and some times I will take cues from them. Not too long ago was one of those days where my colleague stated he was thinking of smoking a whole chicken. I thought that was somewhat interesting as I have never smoked an entire chicken myself. I’ve smoked chicken pieces, but never whole. I decided to give this one a try as I know my wife and kids would love eating a whole smoked chicken as I pretty much always roast them. This recipe is way too easy to make, and believe it or not, they pretty much devoured about 90% of it, leaving me with some leftovers. I was cool with that. Start by adding the water to a large pot. Add the salt and sugar and bring to a simmer. Once it simmers, and the salt and sugar dissolve, remove it from the stove and let cool. Once the brine is cooled, add the chicken to the pot, cover, and let brine for at least 6 hours, but up to 12. Once brined, remove the chicken and pat dry. Mix all of the seasonings together and make sure they are well incorporated. Take half of the rub and save for a later use. Using the rub ingredients, start applying the rub to the chicken, and get all over it. Feel free to get under the skin and in the cavity if you desire. Cover and place in the refrigerator for about 30 minutes or so. During this time, heat some coals and prepare your smoker. If you use an electric smoker, go ahead. Once the coals are heated, add to the smoker, add the water bin, then remove the chicken from the refrigerator and place onto the smoking grate. Cover. Add the cherry wood to the heated coals, and begin smoking. Smoke, covered, for about 4 hours, on low, or until your chicken breast registers 165 on a thermometer, or between 165-175 on the thigh. When the temperature is reached, remove onto a serving platter. The result is nothing short of amazing. It’s perfectly smoked and the exterior is a great, deep smoked color. Slicing into yields juicy chicken that has an awesome smoke ring. Again, my kids and wife devoured this. The kitchen table was quiet that night, that’s for sure. In the future, I will be smoking whole chickens rather than various pieces, that way everyone gets what they want from the whole chicken. Hope you enjoy! 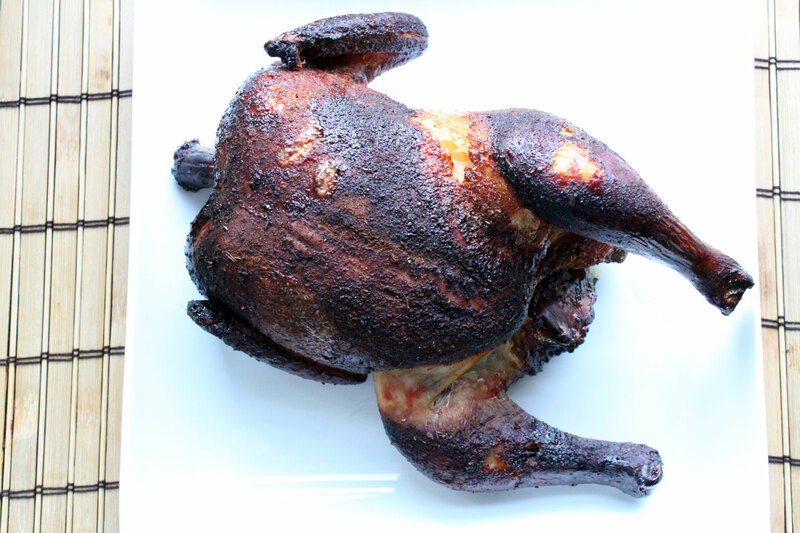 Dax, this smoked chicken looks amazing! And I know it was delicious, too. I grew up in East Texas where hickory was the wood of choice for smoking. And though we have lots of choices in woods these days, I still love my hickory best. You’ve inspired me once again, and I definitely see (hickory) smoked chicken in our future! Thanks Pam! I love hickory as well, along with other woods, but I have lately fell in love with cherry wood. There’s something about it that I really like. Good luck, and hope you enjoy!